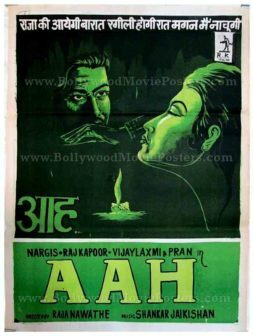 Original vintage Raj Kapoor film poster of the Bollywood movie Aah (1953) for sale. This is an actual surviving publicity poster of the 1953 black and white Bollywood movie which featured the greatest entertainer of all time in Bollywood, Raj Kapoor (also known as The Show Man of Indian cinema) in the lead role opposite Nargis. The film is widely remembered for its blockbuster song “Raja Ki Aayegi Baraat,” which is played till today, making this Raj Kapoor film poster highly collectible. This vintage Raj Kapoor film poster was printed and circulated during the first release of the film (1950s). Originally designed for publicity of the film, this old hand painted Bollywood poster never ended up being used. The poster bears Bollywood poster artist Manohar’s signature style. A fabulous portrait of Raj Kapoor and Nargis is seen at the bottom illuminated with the warmth of a candle in between them. Lyrics of popular songs from the film are seen on the top left of the poster surrounded by musical notes – with “Raja Ki Aayegi Baraat” finding mention right on the top. Aah is a 1953 black and white Bollywood romantic Hindi film starring Raj Kapoor and Nargis in lead roles. The film was produced by Raj Kapoor and directed by Raja Nawathe. This was Nawathe’s first independent directorial venture after working as assistant director to Raj Kapoor in Aag (1948), Barsaat (1949) and Awaara (1951). Although the film didn’t really make waves at the box office, its music composed by Shankar Jaikishan became very popular. The song “Raja Ki Aayegi Baarat” is remembered till today. Stunning old hand painted Bollywood poster of the Hindi film, Bhai Bhai (1970) for sale. This hand drawn two sheet poster measures a stunning 60″x40″ inches in size when its two individual sheets are joined or pasted together. The poster comprises two separate single sheets, each measuring 40″x30″ inches in size. This is an actual surviving vintage Bollywood poster of the 1970 Bollywood film that featured legendary actor Sunil Dutt in a double role. Printed and circulated somewhere in the mid 1970s, this beautiful hand painted Bollywood poster was printed for publicity of the re-release of the film but never ended up being used. This poster was originally designed on a hand drawn canvas by a small time art studio, making it highly collectible. Sunil Dutt is seen in two different avatars predominantly in the poster, giving away the plot of the film where he appears in a double role. Two sheet posters comprise two separate individual single sheet posters measuring 40″x30″ inches each. When pasted together they line up perfectly and together form one single two sheet poster. In the alongside image, there may be a slight gap visible between the two – as the images of the top and bottom half have been photographed individually and then joined together digitally. When framed or pasted, there will be no gap visible between the two sheets and the appearance of the poster would be seamless – i.e. just like a single sheet poster. Bhai-Bhai is a 1970 Bollywood movie that starred Sunil Dutt in a double role. The film was directed by Raja Nawathe and also featured actresses Asha Parekh and Mumtaz. Very rare, original vintage Bollywood movie poster of the romantic Hindi film, Sohni Mahiwal (1958) for sale. This is an actual surviving publicity poster of the 1958 Hindi film that featured Bharat Bhushan & Nimmi in lead roles. This film is an adaptation of a popular folktale in India by the same name, i.e. Sohni Mahiwal. Printed and circulated a few years after the first release of the film (somewhere in the early 1960s), this old Bollywood poster was printed for publicity of the film but never ended up being used. This very rare vintage movie poster features stunning hand drawn artwork. Typography used in the poster is primarily in English, with a translation of the title in Hindi at the bottom. 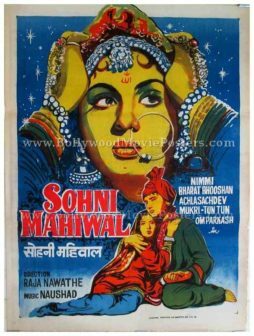 Sohni Mahiwal is a 1958 Bollywood film starring Bharat Bhushan, Nimmi and Om Prakash in lead roles. The film’s music is composed by Naushad and songs sung by Mohammed Rafi, Lata Mangeshkar and Mahendra Kapoor. Hand painted old Bollywood poster of the Hindi film Aah (1953) for sale. This is an actual surviving poster of the 1953 black and white Bollywood movie, which featured the greatest entertainer of all time in Bollywood, Raj Kapoor (also known as The Show Man of Indian cinema) in the lead role opposite Nargis. The film is widely remembered for its blockbuster song “Raja Ki Aayegi Baraat,” which is played till today. 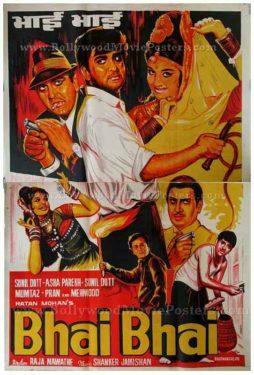 This old Raj Kapoor movie poster was printed and circulated several years after the first release of the film (1960s/1970s). This quirky hand painted vintage Bollywood poster was originally designed for publicity of the film but never ended up being used. The poster was originally designed on a hand painted canvas by a small time art studio, giving it a very quirky appearance. A single green shade (with light and dark tones) has been used throughout this old Raj Kapoor movie poster when it was printed, further adding to its quirk quotient. The typography used in this poster is seen in English at the bottom, whereas the top comprises of a line from the blockbuster song “Raja Ki Aayegi Baraat” written in Devanagari Hindi. A translation of the title in Devanagari Hindi is also seen towards the bottom left of this quirky, hand drawn old Indian cinema poster. This old Raj Kapoor movie poster has been graded as ★★★ AVG (Average) as a number is scribbled on its reverse side (top left hand corner) with a black marker pen. Since the paper is thin, this marking can be faintly seen when the poster is viewed from the front.